EVERYBODY LOVES HARDWOOD- especially ours. Wood is not an afterthought in some back corner of our store, in fact, you will be hard pressed to find any part of the store without its own special stack. If you are looking for unique pieces, you have come to the right place. We offer the area’s largest variety of quality domestic hardwoods and unique pieces of lumber. We stock Good Wood in dimensional lumber, rough sawn boards, turning blocks, and live edge slabs big and small. Whether you pinned it, dreamt it, or sketched it, we can make it. If you have a great idea- send us a picture of your napkin drawing- or bring it in and see us. We don’t like to brag, but if you can dream it up, we can probably make it. Seriously. Not only do we offer the area’s largest selection of hardwood, we also offer expert service and advice. If you need hardwood, then give us a call. If you need help figuring out what to do with that wood, then give us a call. Trust us. We can help. Browse our hand selected, one-of-a-kind Good Wood slabs and custom hand crafted pieces. Once you pick out your Good Wood, we can help you through any step of the process. We can even make it for you if you’d like. Watch the video of our process to see how we turn our Good Wood into heirloom pieces. 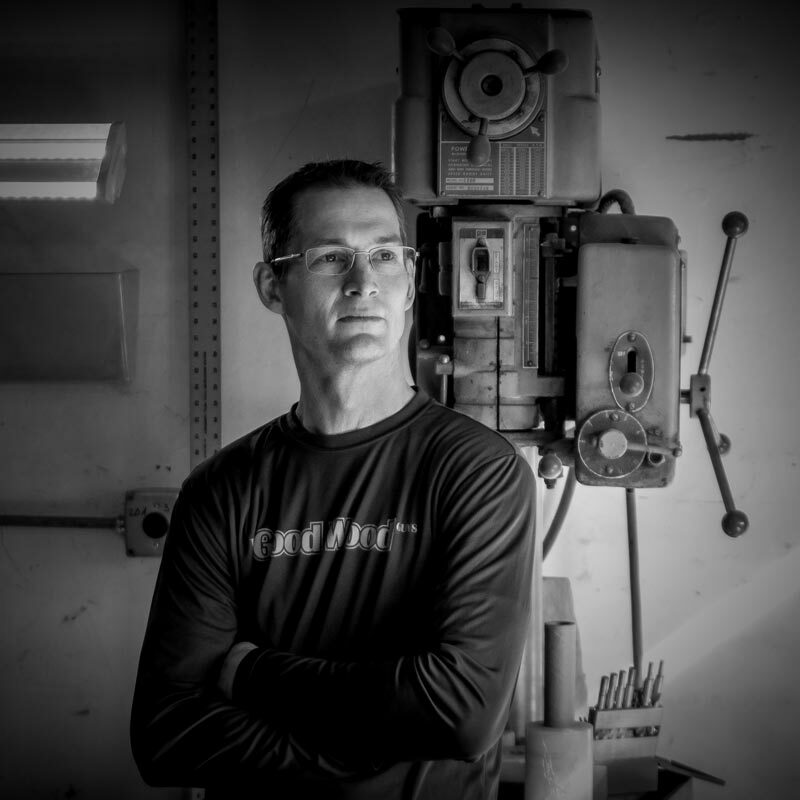 Chris’s education and experience give him a knowledge base difficult to surpass in the retail lumber industry. He spent years in the lumber industry as a millwright before entering retail sales and management for companies renowned for their customer service. He has a Bachelor’s of Science degree in Biology and Chemistry, and a Master’s of Art in Secondary Teaching. He’s been called everything from a renaissance man to a gosh-darn genius. Susan grew up in retail, working at a young age at her parents’ surplus hardware store, when hardware still described wood and nails. 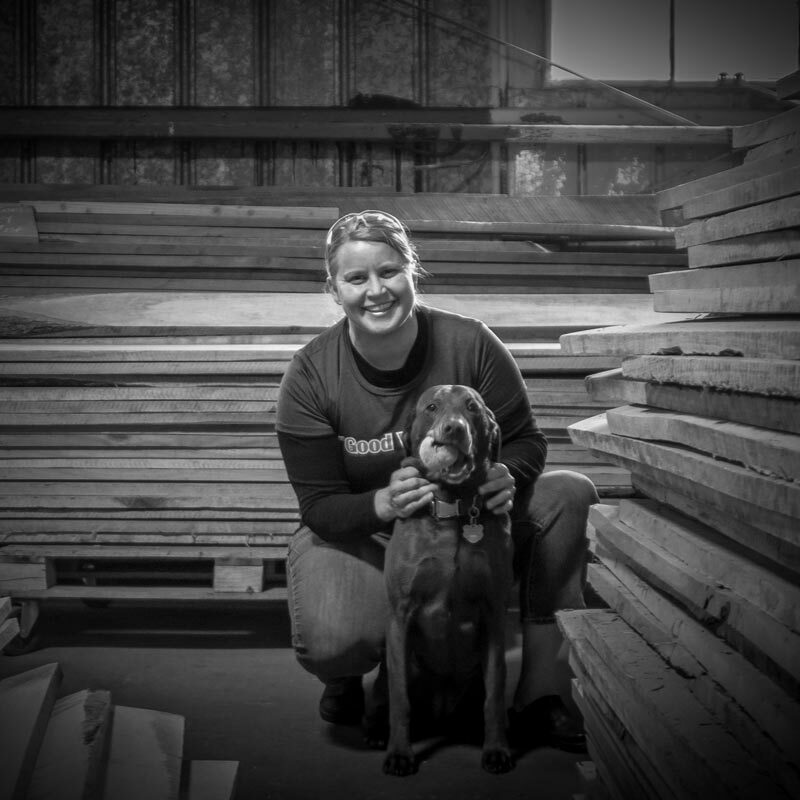 She has since spent the last 15 years assisting Chris with everything from home remodels to heirloom tables, and you don’t spend that much time with a genius without learning a thing or two. In addition, Susan is a beginner wood-turner and proud member of the Great Falls Woodturners’ club. As Chris’s son, Buddy’s cut from the same log, which we like to think is some pretty Good Wood, and while he’ll tell you he still has more to learn, he is way ahead of the curve for a man his age. Need something cut, planed, or dimensioned correctly? Need something glued, sanded and prepped for your next project? Buddy will make your Good Wood great. We never cease to be amazed by the craftsmanship and creativity of our customers, but even experts need help sometimes. Not only do we offer the region’s largest selection of hardwood, we also offer expert service and advice. If you need hardwood, give us a call. If you need help figuring out what to do with that wood, give us a call. We're here to help. Hardwood plywood available through special order. Thanks Good Wood Guys for this beautiful black walnut I used for my shuffleboard table it turned out great and you guys were so helpful, I hope to make it in the store this weekend for some more wood!! Thank you for introducing us to your store and all of you on Small Business Saturday. We appreciated the gift and breakfast treats, but especially learning about you and the wonderful wood you have! Nathan was thrilled to meet a wood turner that will help teach him and introduce him to the craft and he is excited to come to your classes when he can. Merry Christmas! Thought you might like to see the stool we made from the piece of black walnut we got from you. We used steel for the legs and you will be happy to know that I just used the Waterlox sealer on the wood after seeing the look of horror on your face when I said I might stain it. The spoiled dog can now get on the bed.